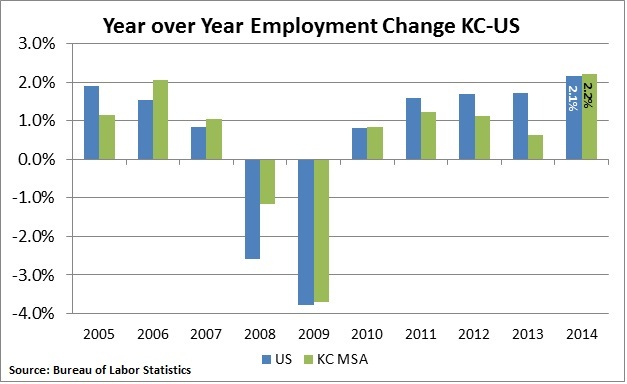 The Kansas City metro wrapped up 2014 in fine shape in terms of employment. Recently released December data shows that Kansas City added over 22,000 jobs between December 2013 and December 2014. This is an increase of 2.2 percent. It marks the first time since 2010 that our employment growth has outpaced the nation — although that wasn’t cause for celebration at the time; both the US and KC growth rates were below 1 percent that year as we emerged from the recession. As we have noted on this blog several times, the Kansas City metro has struggled to gain employment coming out of the recession. Perhaps we’ll be able to look back and see 2014 as the point where we started a new trend.